Hanoi (VNA) – The 18th International Meeting of Communist and Workers’ Parties (IMCWP) kicked off in Hanoi on October 28 with the participation of over 100 representatives. This is the first time the Communist Party of Vietnam (CPV) has hosted the event. Hoang Binh Quan, Head of the Party Central Committee's Commission for External Relations, underlined the significance of promoting fights for multinational peace, independence and sovereignty as well as for workers’ benefits. He stressed the need to observe the UN Charter’s fundamental principles and international law, especially respecting independence and sovereignty of countries, and settling disputes via peaceful means, without intervention in the nations’ internal affairs and use or threat to use forces. The official confirmed that the CPV is persistent with the goal of national independence and socialism building as well as the external affairs policy of independence, self-reliance, peace, cooperation and development. The country always pays much attention to reinforcing and enhancing relations with socialist countries, traditional friends, communist parties, and workers around the world, he said. He took this occasion to thank the global communist parties, workers and peace-loving people for their solidarity and strong support to Vietnam in the cause of national liberation, building and defence. 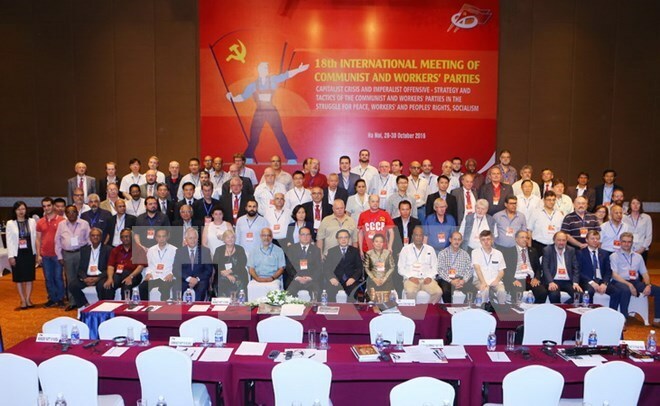 Established in 1998, the IMCWP has attracted over 120 communist and workers’ parties from 85 countries.